SMINTair - Nicotine niche or pipe dream? Where there is demand, the free market shall supply! Smintair is a proposed new airline for nicotine addicts, offering flights from Dusseldorf (it's full name is Smokers International Airways). The founder wants to bring flying back to the "glamorous days", when you could smoke your lungs to cancerland without being prosecuted. 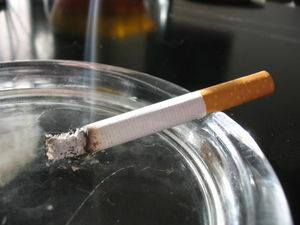 Since 49% of Japanese men (14% of women) and 25% of Germans are smokers, there may just be a big enough market for this! Apparently Smintair believes that smokers are a group who like their partying - the airline plans to allow people to indugle in their vices - smoking, drinking and small-stakes gambling. Sminair's will have bars on the upper and lower deck of their reconfigured Boeing 747, which will carry 138 passengers instead of the usual 400. A back of the matchbox calculation shows that passengers will have to pay approximately 3 times the usual fee for these pleasures. 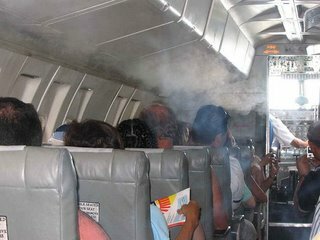 With smoking allowed one would think the air quality would be lousy, however SMINTair claim, that as they add fresh outside air, the cabin air will be as fresh as on any other flight. This will be a good experiment for the industry, as the air circulation systems on most aircraft could do with improvement. SMINTair plans to acquire 2 Boeing 747s from SAA (South African Airways), refurbished and serviced by Lufthansa Technik. The 747s will be reconfigured with 30 first-class and 108 business-class seats and 3 lounges, including a cocktail bar with 12 stools (wonder how they'll work the seatbelts) serving champagne and oysters. The planned in-flight entertainment includes DVDs, telephones, TVs, MP3s and the Internet. You need to cough up a bit more to fly on SMINTair. Everybody on the plane will be sitting in first or business class, with return flights from Dusseldorf to Japan costing between US$6,700 and US$14,500. confirmed slots at Central Japan International Airport (near Nagoya, Japan). At Dusseldorf airport smokers are restricted to lighting up in a few bars. 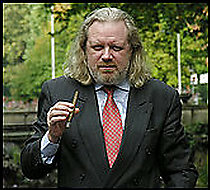 SMINTair was founded by Alexander W. Schoppmann, a German entrepeneur.